It is Saturday, the 26th of May 2018, here in the United States. The first day of a three-day holiday that culminates on Monday. Most of us will try to get out and do something this weekend. In some parts of the country, it’s the start of the beach season. Elsewhere, it might be camping, or a picnic in the park. But this weekend is for something else, as well. And honoring those men and women of our families who gave that “last full measure of devotion” and laid down their lives in the cause of American freedom. In The Legal Genealogist‘s family, that begins with a Virginia soldier who was just 23 years old when he died, that cold December day in 1776. His name was Richard Baker. He was serving with his older brother, my fourth great grandfather David Baker, in the 3rd Virginia Regiment of the Continental Line when Washington crossed the Delaware just after dark on Christmas Day 1776. They were headed to what is known today as the Battle of Trenton. 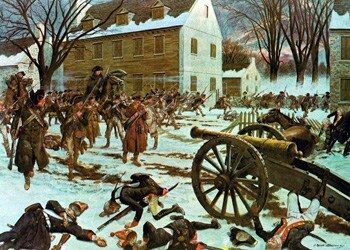 Washington and his troops succeeded in taking Trenton, and they did so at a small cost to his small force. But part of that cost was paid by Richard. We’ll never know for certain if that’s how and when Richard fell, but it well may be. In the end, though, it doesn’t matter. What matters is that he gave his life for the freedom that all of his kin — and all of us Americans — enjoy today. And today, at the start of this Memorial Day Weekend, we express our thanks. And to all who have given their all that we might live free. Thank you for sharing this. I’m also a descendant of David Baker, and had wondered about Richard when I read David’s pension file. Well, hello there, cousin! My line is David -> Martin -> Martha Louisa m. George Cottrell -> M.G. -> Clay -> Hazel, my mother. What an unimaginable time that was. I’m a veteran, and I’m often asked about the difference between Memorial Day and Veterans’ Day. Thanks for helping to point out the distinction. During this weekend, when we all run to the beach and celebrate with BBQ, it’s nice to focus on the true meaning of the holiday. Thank you for sharing the story of your relative and of his sacrifice for our country – heck, for the foundation of our country! It’s good to keep this in perspective while watching war movies this weekend. I, personally, will reflect on my family member – who made his sacrifice during the Korean Conflict. Tell his story — make sure others know it — help him never to be forgotten. There’s no way of knowing, but if Richard Baker Was among the men who seized that cannon with James Monroe, his actions may have saved the life of my 3xggrandmother’s brother, who was also at Trenton that night. He survived the war to return home and raise a large family of children who went on to raise families of their own. So thank you for allowing all of us to know about Richard. I’d also like to recommend this article to anyone who wants to truly understand the price so many ordinary men like Richard paid for our nation’s independence, and the precious rights guaranteed to each of us, personally, in the Bill of Rights. Draw inspiration from their courage, but most of all, never forget. My 7x great grandfather survived the Jersey. There is a statement made to the effect that his health was never the same after that. He died c. 1800 almost certainly as a result of his time on the Jersey.